The Naples real estate market continues to improve month after month. For the 12 consecutive months ending in May 2010, compared to the ones ending 2009, global pending sales increased 47%. The increase for pending sales is noticeable in all areas and all price ranges. The median closed price increased 9% from $174,900 to $190,000. 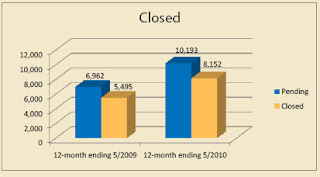 Closed sales during the same period increased 48%, from 5,495 to 8,152. As the inventory is depleting, some communities or subdivisions are shifting to a balanced market or even a seller's market. These figures have been released by Naples Association Board of Realtors (NABOR).